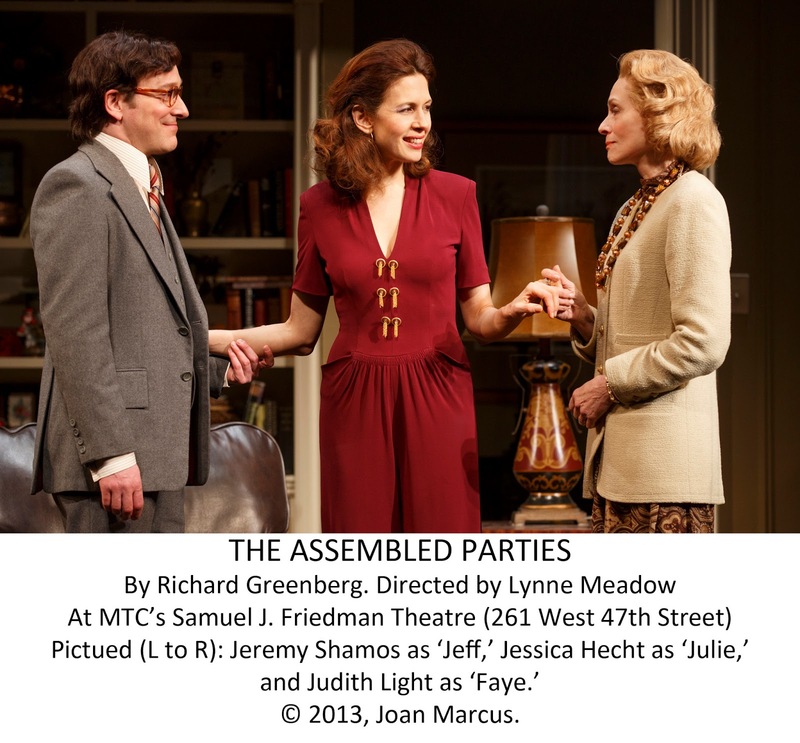 Richard Greenberg’s saga involving a well-to-do Jewish family in a sprawling Central Park West apartment is one of the most engaging plays of the season – consistently funny, but tinged with sadness – and features two mightily impressive performances by, respectively, Jessica Hecht and Judith Light. Hecht is Julie Bascov, a former film actress, now loving mother to Scotty (Jake Silberman), a college grad with a seemingly bright future, and his much younger brother Timmy (Alex Dreier), who, for the entire first act, is confined to a sick bed. Julie’s husband Ben (Jonathan Walker) is a financial bigwig. It is Christmas 1980, and Ben’s sister Faye (Judith Light), Faye’s husband Mort (Mark Blum), and their mentally challenged daughter Shelley (Lauren Blumenfild) have come to visit. Shrewdly observing and admiring the family dynamic, and totally smitten by the ever charming Julie is Scotty’s college friend Jeff (Jeremy Shamos) who falls under the matriarch's spell as she prepares a grand feast for her guests. The second act takes place 20 years later, when the landscape has greatly changed after illness and tragedy, but Greenberg still provides plenty of humor and, ultimately, a hopeful conclusion. Hecht is exquisite throughout. She exudes patrician elegance, and a serene pragmatism, qualities that never desert her even when faced with circumstances that would crush most people. Light is funny, neurotic, and caustic. Sisters-in-law Julie and Faye would seem to be polar opposites, but the passage of time strengthens their bond. Shamos is perfect as the wide-eyed Jeff who, over time, becomes an unofficial member of the family. His awkward early scene with Blumenfeld’s Shelley, when Faye leaves them alone together hoping for a romantic spark, is priceless. Greenberg’s play is extremely observant about life and his witty dialogue is always grounded in truth. Given the time gap in the play’s structure, he’s able to show movingly how life changes, old enmities can seem unimportant, and long-standing offenses may be groundless when the facts finally come to light. Overall, “The Assembled Parties” reveals the sweet poignancy of life’s impermanence, and director Lynne Meadow skillfully illuminates every facet of Greenberg’s themes. Santo Loquasto’s set is one of the glories of the season. During the first act, the evocative set revolves to show several different rooms of the 14 room apartment. In the second, the revolve gives way to a full elongated view of the living room. Peter Kaczorowski’s lighting enhances the authenticity of the setting. Jane Greenwood’s costumes do their part to convey the 20-year time gap, and her dresses for Julie who loves to wear her late mother’s elegant clothes, are particularly stylish and beautiful.